The underlying theme for all of the work in our group is our ability to synthesize polymers by new methods and with properties or combinations of properties not found in existing materials. We simply enjoy making new materials. However, our work extends beyond the synthesis and we characterize the properties of these new materials and test them in potential applications to establish structure-property relationships to further aid in the design of next generation polymers. 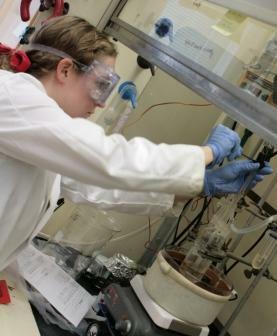 Our work encompasses two main thrusts, polymer nanocomposites and fuel cell membranes. The basis for the work in these two areas includes organic chemistry for monomer preparation and polymer synthetic chemistry in both step growth and chain growth polymerization methods. We simply enjoy making new materials.